Click the "A" to add text. Click and drag text to position. SKU: 3" Round Plastic Tag-02. 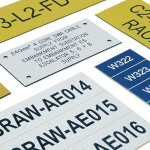 Category: Custom Plastic Tags. Our plastic tags are engraved using a 2-ply plastic. 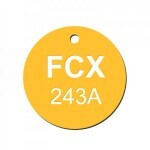 Our round tags are available with holes or adhesive. Choose from our color options and design your tag using our product designer .Order in bulk for a discount. If our online options do not support your needs, please contact us at 409-886-1363.